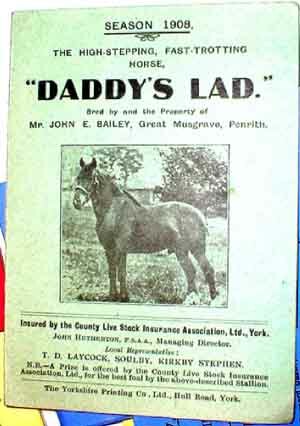 Daddy's Lad, "the high stepping, fast-trotting horse, bred by and the Property of Mr John E Bailey, Great Musgrave, Penrith". He was at stud for the season 1908, and later was exported to Argentina. Daddy's Lad was a locally bred grandson of Tom Jones Evans' Welsh Cob, Comet. Hackney horses were also much admired as "road horses" for their speed, stamina, toughness and spectacular action. Stallions of this type were advertised to serve the local mares in Cumberland and Westmorland. They were quality horses and evidently did not have their stud fees subsidised as the local Fell Pony stallions did (see below). Photo courtesy of Mr R B Charlton & family, Linnel Wood, Hexham. Royal Star's stud card is in the Museum alongside those of the Fell Pony stallions. It is dated 1910. His fee that year was £1 15s. The Fell stallions were subsidised by premiums given to the stallion owner from the War Office via the Fell Pony Society, and so their fees were around 15s. In all cases the groom who travelled with the horse got 2s 6d for each mare served. 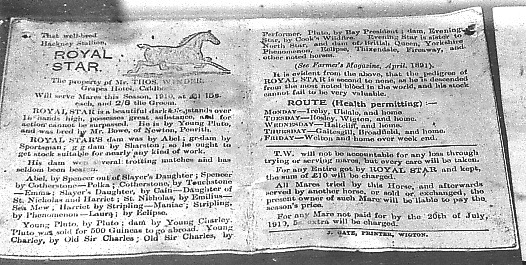 Royal Star's extended pedigree claims descent from famous horses and advises the reader to "See the Farmer's Magazine, April 1891." The pedigree is difficult to follow in the stud card, but transcribed into a table it looks like this: the letters S and D stand for Sire and Dam, to avoid confusion as far as possible. Most recent generations are on the left and earlier ones to the right. The male side of the pedigree is in the upper half and the female side in the lower half. For example, Royal Star's Sire was Young Pluto, and his dam was a mare whose sire was Abel. *Evening Star was sister of North Star, and dam of British Queen, Yorkshire Phenomenon, Eclipse, Fireaway and Thixendale."